Have you noticed the pink explosion on Pinterest? You can tell that Valentine’s day is around the corner with all things in pink and hearts and it’s simply bursting with ideas on how you can express your love and affection. 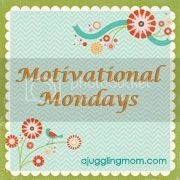 So come next Monday, the theme for my Motivational Mondays in the month of February is all about how we show love to those who mean the world to us. Note: Highlight the code & press Ctrl + C buttons to copy.